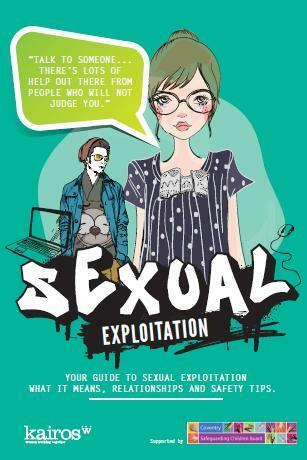 The Kairos WWT team have been working with designer UTI Creative and a team of young people in the city to develop a booklet to be used to raise awareness around child sexual exploitation. Over the last 18 months, Kairos WWT has been expanding its work and expertise in the area of child sexual exploitation working along side partner agencies Streetwise (The Children’s Society) and CRASAC to deliver workshops and 1-1 sessions to young poeple to raise awareness and support young people who have been subjected to sexual exploitation. Our new booklet is aimed at young people, and the professionals supporting them, and contains an overview of the material presented to young people in group sessions and 1-1 work. The booklet, supported by the Coventry Safeguarding Board is being launched this week in a resource pack provided to professionals in 19 secondary schools across the city and to other key professionals working with young people. The booklet can also be downloaded here or view online.